The skin is the body’s largest organ and research proves it capable of absorbing up to 60% of the ingredients in the products we apply. You can’t have beautiful skin if it is loaded with toxins. When toxins lodged in your tissues come into direct contact with your skin cells they can damage if not destroy the cells they come in contact with. Toxins are one of the biggest causes of aged and problem skin. Obviously reducing or eliminating your exposure to these toxins is the first step you should take in your Detox for Beautiful skin program. The Second is getting those toxins out and the third is increasing your life force so that your body’s natural detoxing systems can expel those toxins more efficiently. What skin care products can remove are things like dirt, pollution, free radicals, sweat, dead skin cells and sebum that build up on the surface of the skin as we go about our lives. During a cleanse (or simply with the elimination OR reduction of sugar, alcohol, carbohydrates, processes foods, fried foods, caffeine) stored toxicity is being released from your skin as well as from the cells of your other organs. According to Ayurveda, skin is a natural extension of the blood, so as you release toxins into the blood, you may notice skin changes. For this reason, some people may experience breakouts as the body mobilizes and releases toxins. Detox for beautiful skin is so important for your health and beauty. Your skin is constantly being exposed to toxins; from excessive sun to the chlorine in your bath or shower water and probably most everything you put on your skin and most “yummy” foods and liquids that we are ingesting. 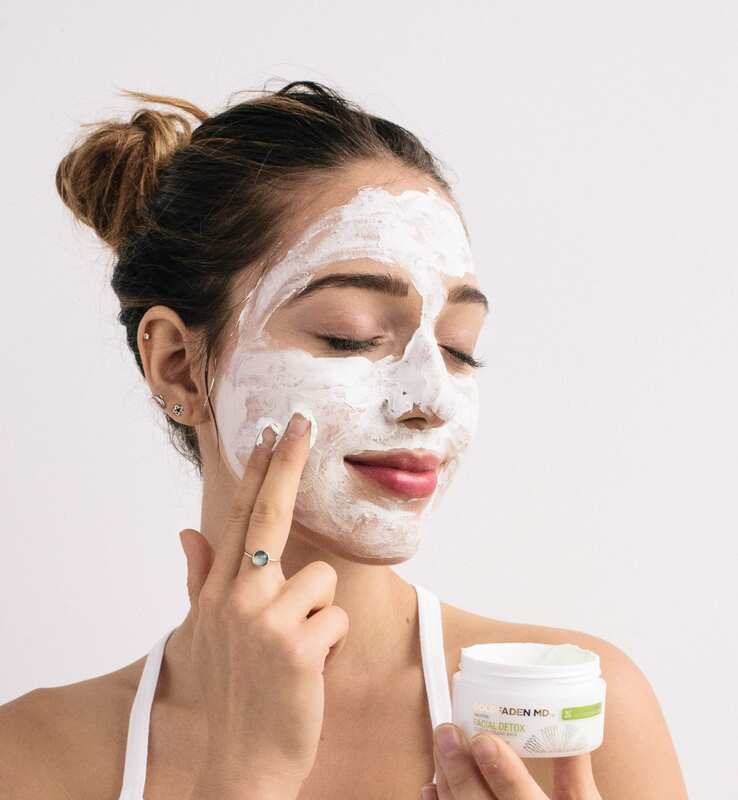 Impurities like dirt, sweat, and excess sebum can clog pores and cause acne and pollution and free radicals that can be damaging and contribute to skin aging. Your skin is an organ of elimination, just like your kidneys, liver, and colon: Just as FYI….The lymphatic system is the part of your circulatory system that rids your body of toxins and waste. If your system becomes overloaded and polluted with toxins, your body can’t efficiently filter impurities, and skin rebels in the form of a dull, sallow, tired-looking complexion―often accompanied by fine lines, wrinkles, acne, blackheads, enlarged pores and/or the dreaded oil slick. When lymphatic circulation slows down, so does cellular turnover, which accelerates aging! Many synthetic ingredients have been recognized to cause skin irritation and may lead to damaging effects longer-term. Commitment is to create safe, yet effective products that utilize the most effective and innovative naturally-derived, result driven ingredients. Beauty + Sleep are so intertwined. science has proven time and again that while we sleep our body goes into repair mode, fixing damage caused during the day and ensuring we wake up looking refreshed and our beautiful best; it’s the intersection of where technology + wellness meet. Waking up looking refreshed requires more than just the absence of under eye darkness or puffiness, the skin tells the story. The restorative power of sleep is vital for rejuvenating and repairing the skin and is controlled by the hormone melatonin and HGH (Human Growth Hormone). Melatonin production increases and peaks around 2am and as well as making us sleepy, it works to counteract damage to the skin during the day from aggressors like UV and pollution. The other hormone that kicks in while we’re sleeping is HGH (the human growth hormone), which is responsible for accelerating skin’s repair and cell regeneration. Night time = ‘recovery mode,’ a time of intense repair and regeneration. We know that between 11 p.m. and 4 a.m., our cell production can double, and if we’re in a deep sleep, you could see cell turnover increase by three times between the hours of 2 a.m. and 4 a.m. Wearing anti-aging products at night allows skin to absorb all the nutrients and ingredients while being in a relaxed state and out range of UV rays and pollution. During the nighttime hours, the skin springs into action to repair itself back into balance through a restorative and renewal process. The skin springs into action to repair itself back into balance through a restorative and renewal process.The most potent anti-aging ingredients to look for in a night cream include: Retinoids, Peptides and Melatonin. The efficacy of melatonin as a topical agent also offers a promising avenue to enhance the skin’s nightly repair cycle.